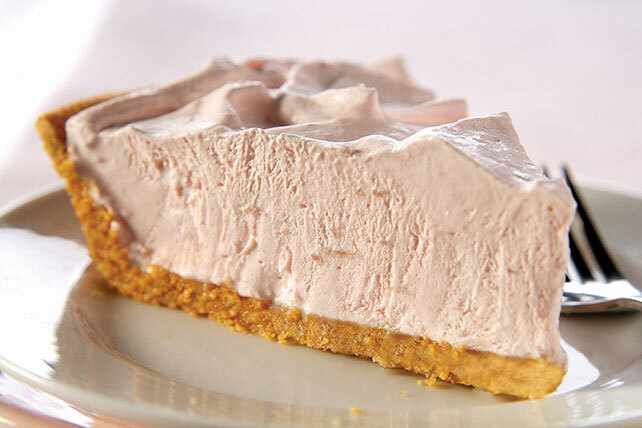 Enjoy a deliciously easy Cool 'n Creamy Yogurt Pie! This Healthy Living yogurt pie takes only three ingredients and ten minutes to put together. Spoon yogurt into medium bowl. Add whipped topping; stir gently with wire whisk until well blended. Freeze 2 hours or until pie is firm enough to hold its shape when cut into slices to serve. Store leftover pie in refrigerator. Stir 1 cup chopped strawberries into yogurt before mixing with the whipped topping. Freeze 4 hours or overnight until firm. When ready to serve, remove pie from freezer. Let stand at room temperature 15 min. or until pie can be cut easily. Store leftover pie in freezer.